This is such a yummy dessert! 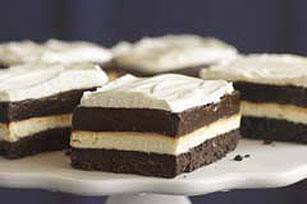 If you love chocolate, whipped cream, cookies, and cream cheese then you will surely enjoy this dessert. This is another recipe that is from the Kraft Food website. There is even a video you can view on how to make it. PROCESS cookies in food processor until fine crumbs form. Transfer to medium bowl; mix in butter. Press onto bottom of 13x9-inch dish. Refrigerate until ready to use. WHISK cream cheese, sugar and 2 Tbsp. milk in medium bowl until blended. Stir in 1-1/4 cups COOL WHIP; spread over crust. BEAT pudding mixes and 3-1/4 cups milk with whisk 2 min. ; pour over cream cheese layer. Let stand 5 min. or until thickened; cover with remaining COOL WHIP. Refrigerate 4 hours. How to Easily Cut Into Squares-Place dessert in freezer about 1 hour before cutting into squares to serve. Variation-Prepare using PHILADELPHIA Neufchatel Cheese and COOL WHIP LITE Whipped Topping.